The World Health Organization in 2004 estimated approximately 1.1 billion people did not have access to clean water and that 35% of Third World residents died from water-borne illnesses. While the situation is grim, recent advances strongly indicate that many of the current water quality problems can be addresses – and potentially resolved – using nanotechnology. Nanotechnology is already having a dramatic impact on research in water quality and Nanotechnology Applications for Clean Water highlights both the challenges and the opportunities for nanotechnology to positively influence this area of environmental protection. Here you will find detailed information on breakthroughs, cutting edge technologies, current research, and future trends that may affect acceptance of widespread applications. The first four parts of the book cover specific topics including using nanotechnology for clean drinking water in both large scale water treatment plants and in point-of-use systems. For instance, recent advances show that many of the current problems involving water quality can be addressed using nanosorbents, nanocatalysts, bioactive nanoparticles, nanostructured catalytic membranes, and nanoparticle enhanced filtration. The book also discusses existing technologies and future potential for groundwater remediation, pollution prevention, and sensors. The final part discusses the inherent societal implications that may affect acceptance of widespread applications. Over 80 leading experts from around the world share their wealth of knowledge in this truly unique reference. Institutions such as Center for the Purification of Water and Systems (Univ. of Illinois at Urbana-Champaign); UCLA Water Technology Center; Carnegie Mellon University, University of Kentucky; The University of Western Ontario; Pacific Northwest National Laboratory; National Institute for Advanced Industrial Science and Technology (Japan), Munasinghe Institute for Development (Sri Lanka) and the Woodrow Wilson Center for Scholars are just a few of the knowledge centers represented in this book. Water quality is a serious, global issue in which government bodies and scientific communities face many challenges in ensuring clean water is available to everyone. Nanotechnology is already showing dramatic results, and this book is an attempt to share current technologies and future possibilities in reaching this goal. "Researchers and practitioners may find in this volume, key challenges regarding clean water resources. The presentations may crystallize new research and education programs." 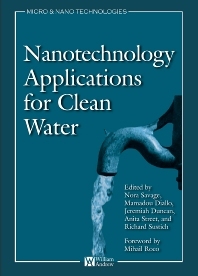 • Contributors from the US, India, Canada, Japan, UK, Sri Lanka, and South Africa • Provides detailed information on breakthroughs, cutting edge technologies, current research, and future trends that may affect acceptance of widespread applications • Covers specific topics including using nanotechnology for clean drinking water in both large scale water treatment plants and in point-of-use systems. • Discusses existing technologies and future potential for groundwater remediation, pollution prevention, and sensors • Highlights both the challenges and the opportunities for nanotechnology to positively influence this area of environmental protection. Engineers, researchers, students of water quality, water and wastewater management, groundwater remediation and pollution prevention. Policy and government officials.